We actually made the quilt the week after market last October. The did the photo shoot the first week of November, and finally in February we get to see it. We were approached at market by the magazine editors. She wanted to use "FEELIN ALRIGHT"
We love this quilt and you can see the details on the website, http://www.abbeylanequilts.com/. Ok, back to the story. 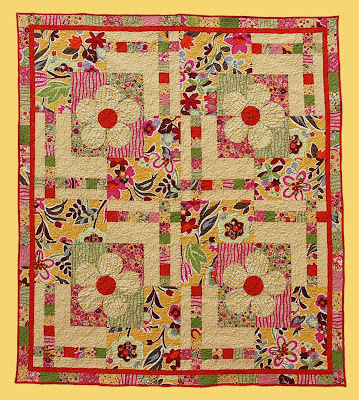 We told the editor we had already sold patterns, so we decided to do a new quilt for the magazine using the same fabric. It is from Moda, by Sanae and the collection is called "OZ" and just came to the stores a couple of weeks ago. That means it is sitting there waiting for you to get some. It is beautiful fabric. 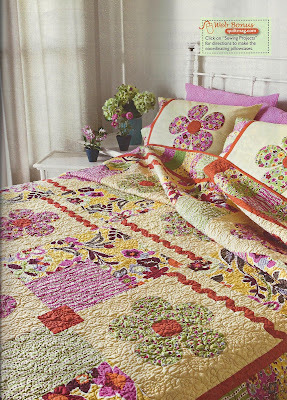 When we told the editor we would do a new quilt, she asked us to make a bedspread size. 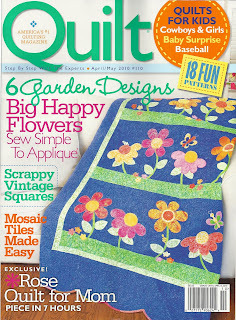 That is exactly what we did, the magazine quilt is different from the original and is a full/queen size. 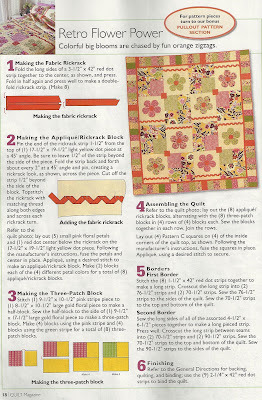 We did bonus pillowcases which the website for QUILT Magazine is offereing a bonus pattern on line. 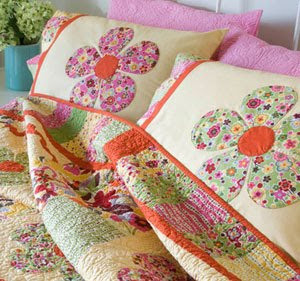 Here is the link for their website, http://www.quiltmag.com/sewing-projects/quilt110-retro-flower-power-pillowcase/ . 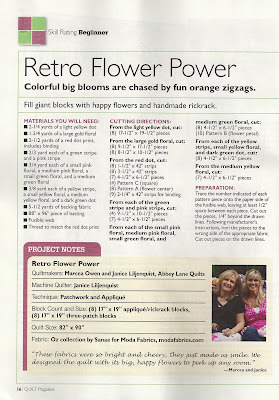 The magazine wrote instructions in a pdf downloadable, here is the link for that, http://www.quiltmag.com/wp-content/uploads/2010/01/finalretropillowcase2.pdf . Ok, enough of the self-promotion, hee hee, let's go ahead and just show you the pages. Make sure and run, not walk to your local grocery or quilt store and pick up your copy. I bought 2. 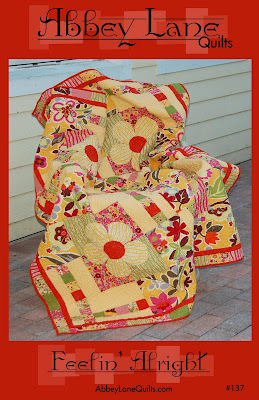 Even better, make one of the two quilts. You will love it. I am heading out in the morning to help my son, his wife, and 10 month old baby drive from Utah to Philadelphia, PA. He was transfered. Three days in the car. Wish us luck. I am taking the camera along, can't wait to see what we see. I will be sure to pick up a copy this week! !